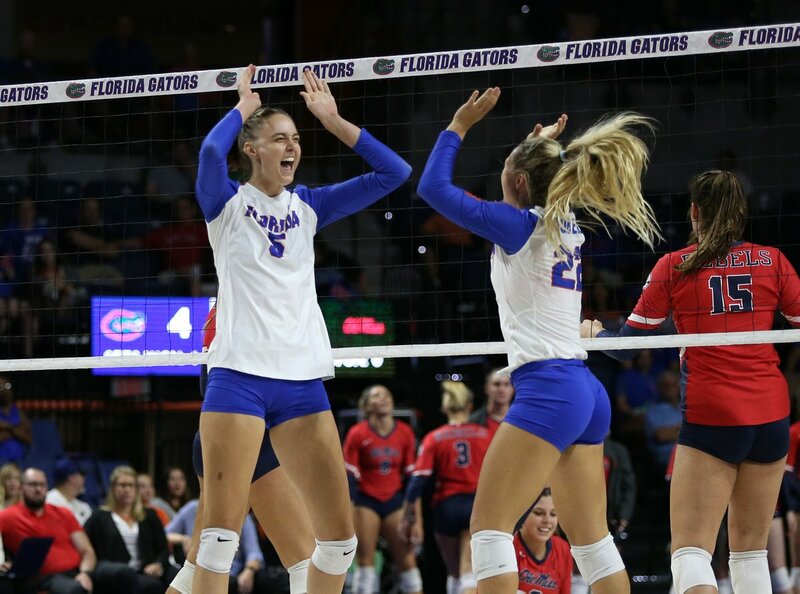 Florida won its ninth straight match and fourth in SEC play with a sweep of Alabama on Sunday. This is the 23rd time under coach Mary Wise that the Gators have began the conference season at 4-0. The Gators used a dominant effort on the block and from the service line to move to 45-0 all-time against the Crimson Tide. Florida bested Alabama 10-2 in aces and 11-4 on the block, while also boasting a .217 to .137 lead in hitting efficiency and a 42-31 edge in kills. Taelor Kellum (12) and Rachael Kramer (10) were the lone players to post double-digit kill tallies in the match, each doing so while hitting .400 or better. Kramer turned in a team-best .556 hitting effort (10-0-18) and six blocks, while Kellum hit .400 and added four stuffs. Thayer Hall was next on the team with seven putaways, eight digs and two aces, but hit just .037 on the night. Allie Monserez and Holly Carlton led the team from the service line with three aces apiece. Doris Carter and Erin Curl notched eight kills apiece in a balanced attack for Alabama. Ginger Perinar (7) and Hayley McSparin (6) followed. Curl hit at a .467 clip. Cidavia Hall put up a team-high three blocks. The Crimson Tide boasted a 9-7 edge in Set 1 when Florida turned it on to the tune of seven straight point, including two Monserez aces and two Kellum blocks. Facing a 22-14 deficit after another 3-0 Gator run, including an ace and a kill by Paige Hammons, Alabama made a comeback with six of the next eight points, including two to thwart Florida set-point tries. Carlton cut the rally short with a final kill at 25-20. The teams tied 10 times in Set 2, last at 15-all, before Florida pulled away. A 6-1 run, with two kills and a block by Kramer, gave the Gators a 20-16 advantage. Alabama scored three in a row to narrow the gap to two at 22-20. Florida called timeout and scored three straight out of the break to seal the 25-20 victory, winning the set on a Hall ace. Alabama kicked off Set 3 with a 6-3 run including aces by Perinar and Kaylee Thomas and three Gator miscues. Florida answered with four straight points, including two perfect serves by Carlton. After falling behind 15-12, the Crimson Tide tied it up at 15-all with help from two UF errors. The teams would tie again at 20, sparking a string of five ties, last at 24. Alabama led 23-22, but a pair of Hammons kills gave Florida its first match-point try at 24-23. Carter answered for the Tide to knot it at 24. The Gators called timeout and Kramer came through with a kill and a block to wrap up the win at 26-24. Florida is set to play host to Texas A&M on Friday and Georgia on Sunday. Alabama hits the road for a Wednesday match against Tennessee.